The price I will quote you will be the price you pay, The cost basically depends on how much time I have to spend on your website. You can greatly influence the time spent by providing lots of great content, having a good idea what you would like your site to look like and coming up with a website name that both tells the search engine what and where you are about. Sorry but its all good. If you would like some references from clients of mine I am happy to give you names and contact numbers on request. We meet up. If you come here to Derrykyle there is no charge, if I have to travel to your site then I have to cover my time and petrol expenses. However, if I’m coming to your place of buisiness I am quite happy to take photos for the site and sit down with you and setup URL registration / Web Hosting and any other chores while I am there. 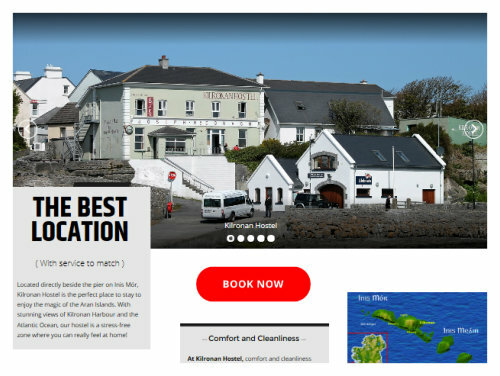 www.kilronanhostel.com I use Simfatic form creation software to make forms as the forms are hosted in on my customers server and you cannot truly call your website secure if you have web forms hosted by an external company like Jotform. 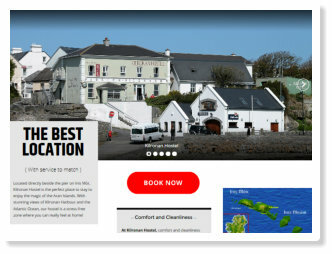 Kilronan however use Gomio booking software as a solution for taking bookings and payment online. STORY About Rob I’m not what you might expect from a website design savy individual, I’m in my 50’s and you also wont employ me for my looks but then again I’m not selling underwear, it will be my job to help you make the on line side of your business work for you. I come from Scotland originally and haven’t lost my accent although I spent 20 years in Australia and am an Aussie citizen. The accent does not seem to be a problem dealing with my customers and I remember a small amount of Gaelic from back home. If I need to have Irish translation in the site I outsource this work to a person fluent in the regional Irish required. I’m a married man ( for 29 years ) an ex Sea Captain by trade and I have been designing websites now for over ten years, in the time I have been designing websites there have been huge changes and these are ongoing with the search engines constantly changing the way they rank websites. I look forward to working with you. Below are a couple of websites I had “free reign” designing, from my clients I asked for the “feel” they required and also the type of customer they were seeking to attract. The tour was wonderful - the history of the mines was really interesting and our guide John was very friendly and informative. We also had lots of fun panning for gold and gems. I'd love to go back! Elaine was born and raised on Long Island, New York, in a small town called Cutchogue. Her family home was on the edge of a creek that led out to Peconic Bay. Sailing, boating, fishing, living close to the water’s edge defined her entire home life. Connemara’s shores became home to Elaine in 1996 when she moved here with her husband. 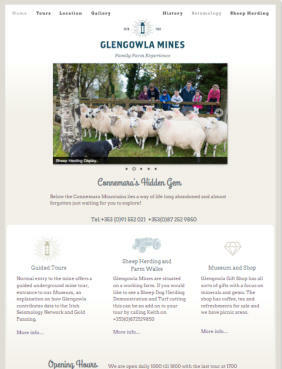 During her time in Connemara, Elaine has devoted her time to teaching art to children, young adults and adults. For SEO reasons I got Elaine to register the URL www.connemaraoilpaintings.com and I took colour inspiration from her lovely painting series of crashing waves. 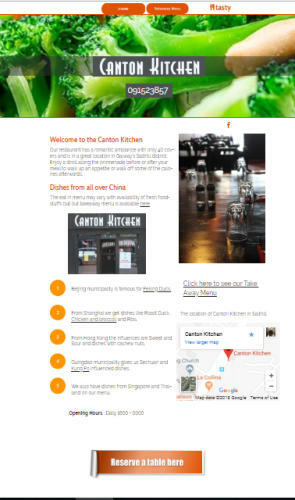 This is an example of a very inexpensive website all it is really is two pages acting as a brochure for the restaurant their takeaway menu and an online form to email for reservations. Gabriel of Aran Goat's Cheese will introduce you to his herd of goats and take you through the process of making his award winning product before sampling and experiencing the range for yourself. His beautiful Nubian and Saanen goats graze on the unique pastures of the Aran Island. 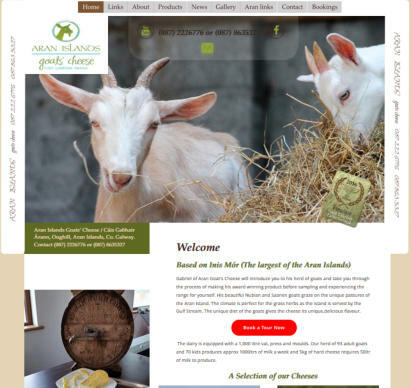 I had total free reign with this website and it took less than a week to complete, the goats were a good photographic subject and I love visiting Inis Mór. The company logo already existed so I based my colour pallet around it and the owner was already actively using social media for his business.